Jefferson County Businesses Are Becoming More Bicycle Friendly! Purchase a "Bicycle Benefits" Helmet Sticker and ride your bike to the businesses listed below to receive a perk and learn more about how your business can support cycling. Decide on the benefit you’ll offer. Need ideas? Check out the website to see what other businesses offer. A minimum discount of 10% is recommended. The idea is to give a large enough perk to change people's minds to bike rather than drive. Once you are set up, reach out to some of your neighboring businesses to get listed on their websites. Your business will also be included on the Bicycle Benefits website. Bike Benefits stickers are supported throughout the United States from Washington to Florida. Check out all of the sweet perks you can get all over the country just by riding your bicycle. Yay for Cyclists!! 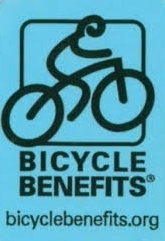 Visit BicycleBenefits.org for a complete list.